“I am sure that we will come to an agreement with the European Commission,” Polish Prime Minister Mateusz Morawiecki stated during the Future of Transatlantic Relations (FOTAR) international conference held in Hamburg on Saturday, referring to the recent dispute between the EC and the Polish state on the Supreme Court Law. He argued that the reform is intended to increase the efficiency of the judicial system. 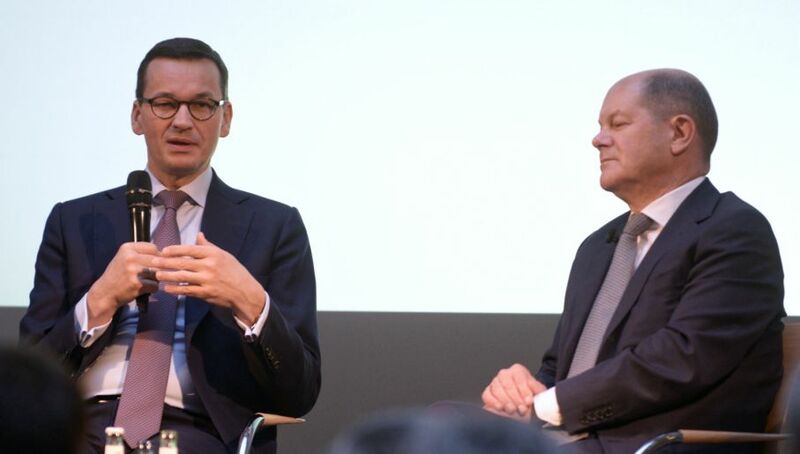 "These are our intentions and I believe that we are heading in the right direction," Mr Morawiecki added. "What we needed was to reach a compromise and then have a dialogue, which is happening now" - the Prime Minister stressed. He also said that within a few days Poland would present and propose "certain changes" on the Supreme Court Law to the European Commission. "We hope that the EC will be satisfied," Mr Morawiecki stated. PM Morawiecki said that despite guarantees from the German government that Nord Stream 2 was only a business project, nobody in Eastern Europe believed that. He also stressed that from Poland’s perspective the pipeline is a very dangerous project. “If it turns out that after the construction of Nord Stream 2 that the Ukrainian gas transmission system becomes redundant, what will stop [the Russian president - PAP] Vladimir Putin from marching on to Kiev? ", PM Morawiecki said, referring to the current situation in which Russia is, for the time being, dependent on transferring gas via Ukraine. PM Morawiecki shared his assessment that the reasons behind the deterioration in transatlantic relations after Donald Trump was elected the US president lie "on both sides of the Atlantic Ocean." "We are convinced that Poland should take an active role in repairing these relations," he stated. PM Morawiecki pointed out that "there are not many countries like Poland, which are very pro-American, pro-Transatlantic and, at the same time, pro-European." “I would opt for a strong EU army, but to create this member states must increase their defence expenditure first,” Mateusz Morawiecki stated, in reference to the recent opinions coming from the EU about European Union member states creating a joint European army. He quoted the expenditure of the largest European countries on defence: 1.23 percent of GDP in Germany, 1.78 percent in France, and 1.68 percent in Spain, and compared it to Polish expenditure, that almost met the initial target of two percent (1.99 percent of GDP). “This is an initial requirement: when these countries achieve the two-percent GDP level of defence spending, then we will be able to talk more seriously,” PM Morawiecki concluded. During the event, taking place in Hamburg, the Polish PM, along with Germany's Federal Minister of Finance and the Vice Chancellor Olaf Scholz, took the floor in a discussion entitled "A European Perspective for the Future of Transatlantic Relations."